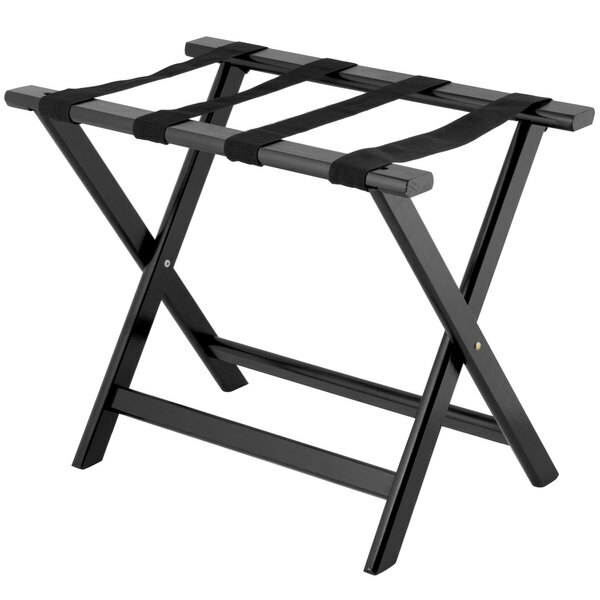 Give your guests a safe, secure stand to hold their luggage off the floor with this Lancaster Table & Seating 24 1/2" x 15" x 20" black wood folding luggage rack. This luggage rack's sleek black finish ensures a professional appearance that's great for hotels and motels, alike. The space-saving folding design ensures out-of-the-way storage yet it flips open easily for instant service. This luggage rack's solid wood construction gives it a more upscale feel when compared to metal racks. Four nylon straps give it the support it needs to hold up to 66 lb. of weight, ensuring entire suitcases will be supported with ease. Store it in your guest room closets, and give your guests the convenience of home with this luggage rack. Weight Capacity: 66 lb. / 30 kgs.